The Suunto Smart Sensor included in your Suunto Ambit3 Sport package (optional) is already paired. Pairing is required only if you want to use a different Bluetooth Smart compatible heart rate sensor. Pairing procedures may vary depending on the POD or heart rate (HR) sensor type. 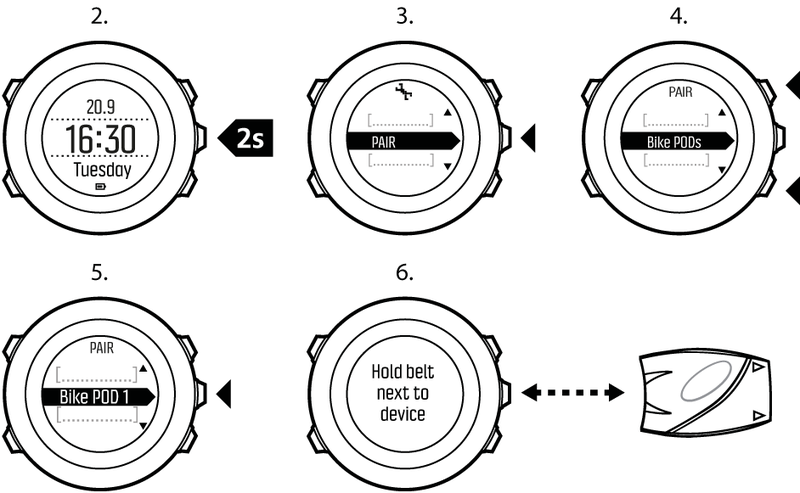 Please refer to the user guide for the device you are pairing with your Suunto Ambit3 Sport before continuing. Hold your Suunto Ambit3 Sport close to the device you are pairing and wait for Suunto Ambit3 Sportto notify that pairing was successful. If the pairing fails, press Start Stop to retry, or Light Lock to return to the pairing setting. Suunto Ambit3 Sport automatically calibrates your power POD when it finds the POD. You can also calibrate the power POD manually at any time during an exercise. Suunto Ambit3 Sport starts calibrating the POD and indicates if the calibration succeeded or failed. The bottom row of the display shows the current frequency used with the power POD. The previous frequency is shown in parentheses. If your power POD has an auto zero feature, you can turn this on/off through your Suunto Ambit3 Sport.